In today’s crowded marketplace, generic messages are losing their effectiveness among customers. The reason is simple: they have way too many options to choose from and refuse to be fed the same old sales pitches of a product being the ‘best in the market’. Moreover, customers want their interactions with the brands to be personalized – not just during the sale but also post that. Now if you “google” a particular product – for instance – “cool t-shirts”, you will find a number of eCommerce firms, and brick and mortar retailers selling similar products. The competition level for this product itself is so high, that it becomes impossible for a brand to completely penetrate into the minds and lifestyles of the customers. Unfortunately, the route that most marketers take to promote their brands is ineffective. In their strive to keep all their digital profiles up-to-date and active, they end up using computer-generated automated messages while connecting with their prospects. This practice kills the connection between you (the seller) and the buyer. And the authenticity of your brand, is lost in the market noise! An October 2015 study by Forrester Consulting and SAP Hybris, revealed that 37% of consumers delete majority of marketing emails without even opening them. Similarly, 40% of them feel like the so-called promotional emails have nothing interesting to offer! This clearly shows that tailoring interactions with both loyal and prospect customers to make the sale is crucial. It is important to appeal to their interests before yours. In a bid to strengthen engagement, Styloko.com, a London-based fashion eCommerce firm, invented its own algorithm to tailor the shopping experience of its customers. From products, price ranges, patterns and colours – the website literally interacts with the customer as he or she browses through the various categories. Now having an exclusive algorithm to personalize your audience’s experience can be a tedious and an expensive task to execute. Frankly speaking, this is not rocket science and you certainly don’t need to be a data scientist to decipher the answers to these questions. Simply, collate and analyze your customer data! Thanks to marketing technology, you can easily employ and manage marketing cloud platforms, social-listening tools, content management systems, analytical tools and more that serve to understand the wants and preferences of your customers. When it comes to one-on-one marketing, don’t think of the channel through which you are going to communicate with your targeted customers. According to Responsys.com, 53% customers are more likely to buy from your brand, provided you personalize communication with them across all digital platforms. The same study revealed that personalized digital communication will have a positive impact on customers between the ages of 18 to 34 years – yes, the millennial market! Therefore, it is important to alter your strategy to fit your audience segment’s needs and personalize their entire experience with your brand. As a brand, you have to undertake a customer-centric approach to engage your prospects. Quite interestingly, even today, 40% customers can be acquired by personalized email marketing post their visit to a website or retail store. Ask questions when a potential customer comes to your website. Your point of sale has to begin with the first digital footprint of that customer. Ask if (s)he is looking for anything specific? Show options to convert a curious customer into a potential buyer! Send out relevant messages targeted to the customer’s behaviour and situation, location, purchase history and time of day. To understand which e-mail strategy works for which targeted group and at what time, A/B test different schedules. When it comes to sending out e-mailers, you have to make sure it addresses to one particular customer, not an entire group! 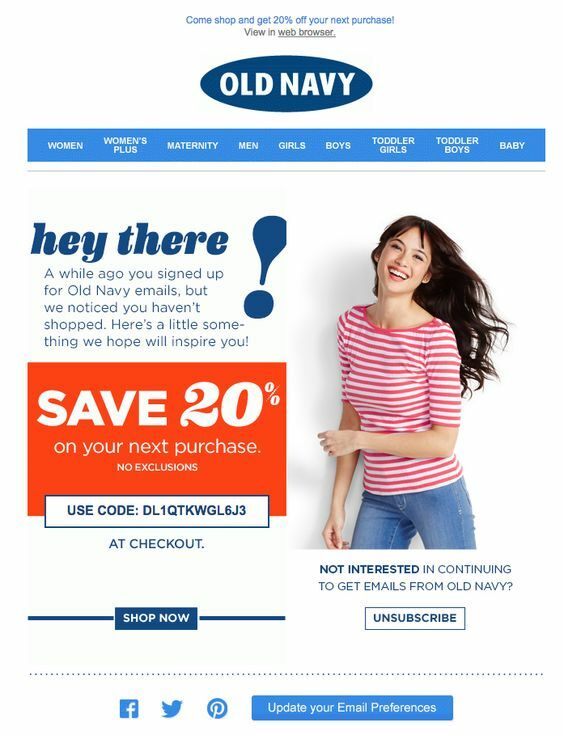 Old Navy, for instance, started generalizing subject lines of their e-mail newsletters – which annoyed many of its loyal customers and resulted in them moving away from the brand. In simpler terms, when you can retain your existing customers and acquire new ones by sharing relevant content and personalizing their experience of interaction with your brand, why risk losing them because of mere ignorance of their needs? You can collect social data, CRM data, prospect tracking data and more to ensure automated segmentation, digital content and lead nurturing campaigns. Digital content is based on the attributes of the customer’s profile in your marketing and sales database – which in turn will help you pick and display pricing options, promote relevant marketing offers and push topical features. Nurturing campaigns are designed to provide information and content at the same time – that are triggered post a customer-action. These campaigns make the sales process seem like a one-on-one marketing service. Trying to reach out to your prospect market and understanding their needs in a changing digital world, can be a tedious task. It is important that marketers recognize which efforts they need to automate and where they need to focus on more to deliver effective personalized campaigns. Personalization of marketing campaigns can be a time consuming task. It is important for marketers to equip themselves with nifty tools like Wigzo to get the right message across to the right segment of your audience, at the right time and via the right channel. Start personalization of your campaigns with Wigzo! Get your FREE trial today.